BREAKING NEWS!!! Today Addition Elle‘s “I Have Great Genes” campaign has been released! The campaign features famed plus size bloggers, jeans, and will tie into a plus size model search! I am so excited for this campaign, not only because I am featured in the video for it, but also because it gives so many woman the chance to show off their curves and enter for a chance to win a modeling contract! 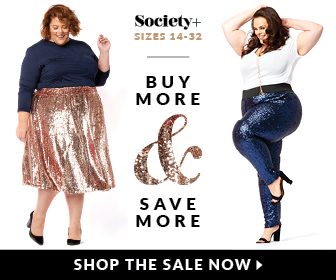 I am inundated with questions daily on how to become a plus size model, and this campaign offers a wonderful opportunity for women to take a chance on their dreams. The plus size model search starts September 3rd (which also happens to be my birthday hehe) so hopefully one of my lucky followers will win! The Fall 2013 “I Have Great Genes” campaign will see a creative and empowering video featuring three influential plus-size bloggers. These brand ambassadors are Toronto’s Karyn Johnson, New York’s Nadia Aboulhosn, and Chicago-based Gabi Gregg. Addition Elle explains, “Our hope is that this campaign will really resonate with our fan base, and create a dialogue in real-time focused on great genes and that confidence and beauty is innate to every woman. We are excited to partner with three influential and fashion-forward plus-size women who proudly personify the Addition Elle brand through their confidence, adventurous, and fashionable style”. Taking the concept of the “I HAVE GREAT GENES” campaign even further, Addition Elle is using this opportunity to ask the question ”Do you have great genes?” And with that, they are opening up a Canada and United States wide Model Search. Contestants will have the opportunity to submit photos of themselves from September 3rd – October 6th. After several rounds of selection – by fans as well as judges – finalists will be paired down to top twenty and then top five. These top five will then be flown to New York City to participate in a fashion photo shoot, all of which will culminate with the announcement of the winner November 27th. For this Model Search, Addition Elle is partnering with New York-based Modeling Agency JAG (formerly of Ford plus-size modeling), and plus-size fashion blogger Gabi Fresh. Also on the judging panel will be the fashion Editors of Elle Quebec and Elle Canada. The grand prize is a $1000 shopping spree at Addition Elle, a feature in an upcoming Addition Elle Look Book, and a chance to sign a modeling contract with JAG.